Amallibya Catering Company Libya have been operating catering and hotel services for the last 8 years, we provide catering services in Libya to a whole host of companies, Universities and hospitals. We can take care of all you catering and janitorial needs in the city or the desert. We operate in deep desert conditions and also in very remote locations. Our hotels offer value for money with very high standards and a great friendly atmosphere. Our staff will go out of their way to help you in our hotels and catering operations, we strive to offer first class services at a reasonable price. Catering in Libya for more than 28 years we have a deep knowledge and understanding of our clients needs, we understand what it takes to provide catering services in remote locations and in deep desert locations in Libya. Our managers have excellent experience managing and operating various catering contracts in Libya, from Sirte Oil Company at Marsa El Brega to Zuetina Oil Company in 103A and 103D. From base camps to Oil rigs to Oil terminals we are able to provide fist class catering services in Libya. Our staff are recruited from all over the world including, UK, Philippines, Morocco, Tunisia, Malta, Bangladesh and Libya. Our staff are all trained and qualified and are full medically tested. Huge freezers and dry stores ensure our clients receive only the very best quality in food items. Our huge fleet of Refrigerated trucks ensure that we can meet our clients demands and expectations. We can provide a full turnkey catering service matched to your requirements, Amallibya catering company Libya can provide meals for your office and a full cleaning and beverage service, the choice is yours just let us know what you need. Amallibya has excellent experience catering and cleaning inside Libyan cities and towns. We can serve breakfast, lunch and dinner or any combination of those meals. Apart from that we can also provide VIP meals and self-service buffet style meals in you offices for the occasions when you have special guests. Our cleaning services are second to none and we guarantee a great service. Cleaning services include sweeping and washing floors, polishing, window cleaning, rubbish removal, general cleaning and laundry service if needed. Our tea and coffee service provides everything you need. We supply all the beverages and other items such as water, we can also supply the waiter to serve you in your offices. Please feel to contact us for more information regarding our cleaning services in Libya. We are the leading Catering Company Libya. Hotels In Tripoli and Ajdabiya. Our hotel in Ajdabiya is close to Marsa El Brega and to the Libyan Oilfields; it is a 45 minute drive to Brega and 2 hours to Gailo and the Oilfields. TheÂ Ajdabiya hotel has two meeting/conference rooms ideal for training or entertaining clients, Ajdabiya hotel has a first class Al A Carte restaurant and coffee shop. With 4 suites and 50 rooms you are sure to find the hotel room to meet your needs. We have two hotels in Tripoli both have fantastic Al A Carte restaurants, coffee shops and Wi-Fi, our boutique hotel is right in the heart of the city and within walking distance of the business district. The hotel has great views out over the Mediterranean and the hotel specializes in fresh fish dishes. Rooms for our Tripoli hotel can be booked via our online booking form. Located in the Hi Damask area of Tripoli near to the main ring road. This hotel in Tripoli is very handy for Tripoli airport and also the city centre. The hotel is set in a quiet and safe area of Tripoli away from the hustle and bustle of the city centre. Although it is easy to reach should you want to visit the city. The hotel has 30 twin and single rooms, and also boasts 17 suites. As with all our Hotels and businesses we can guarantee you will be delighted with our levels of cleanliness. The hotel offers a Al A Carte restaurant and also coffee shop with free Wi-Fi. We have a full laundry service and also provide room service if required. We have a free pick up and drop off from Tripoli international airport. To make use of this offer please use the Tripoli hotel booking form. And please mention you would like to be collected and the date of arrival. 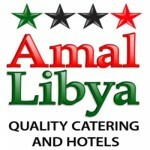 Make Amallibya Catering and Hotel Services your one stop for catering and hotels in Libya. Amallibya catering company Libya. if you want to call me this is my contact no.